The rain, drizzle and fog didn't dampen the spirits of hundreds of athletes, volunteers and spectators at yesterday's Capital Subaru St.John's Triathlon. More than 160 triathletes took part in the standard distance, sprint distance, duathlon, and team events. Steve Dyke was the winner of the standard distance 1k swim, 46k bike ride and 10k run in a time of 2 hours, 9 minutes and 2 seconds. 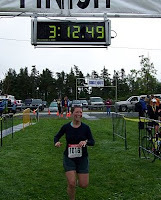 Kathy Whelan was the first woman across the line in 2:21:31. Full results and tons of pictures will be posted soon. And mark your calendar for the 25th Annual on August 9 2009.